GENEVA — The word “Russia” will appear on the Olympic uniforms worn by the athletes granted an exemption from the country’s doping ban at the Pyeongchang Games. More than 200 athletes are set to compete in South Korea as an “Olympic Athlete from Russia” if they can prove they are not tainted by doping. The International Olympic Committee on Wednesday published guidelines for restrictions around the use of “OAR” on approved uniforms. “Russia” cannot be more prominent than the words “Olympic Athlete from.” The logo proposed by the IOC features the complete phrase around a circle, with Russia upside down. 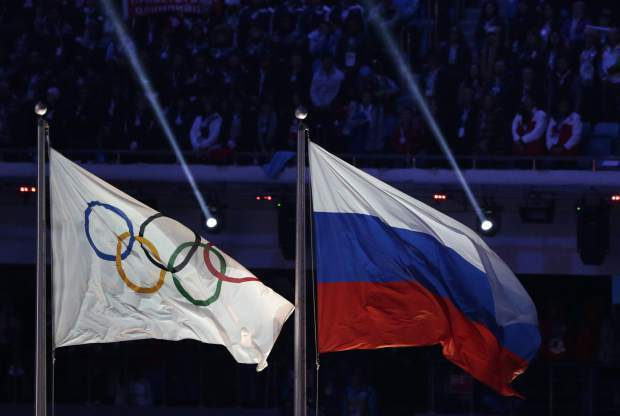 The exact colors of the red, white and blue Russian flag also cannot be used, the IOC said. Darker tones of red and blue will be allowed. A maximum of two colors can be used, and the IOC specifically bars separate items of clothing that create a tricolor effect like the flag. The list adds detail to punishments imposed on Russia two weeks ago by the IOC for running a sophisticated doping program at the 2014 Sochi Olympics. With the Russian Olympic Committee now suspended, an IOC panel chaired by former France sports minister Valerie Fourneyron will decide which eligible athletes can be invited to compete in Pyeongchang. Detailed eligibility criteria have yet to be published. The fallout from Sochi doping is still being felt less than eight weeks before the Pyeongchang Games open on Feb. 9. Also Wednesday, an IOC disciplinary panel published more detailed verdicts to explain why three Russian bobsled gold medalists have been disqualified from the Sochi Games and banned from the Olympics for life. The judging panel, chaired by IOC executive board member Denis Oswald, said it used independently verified evidence to find the trio guilty. Urine sample bottles for all three men in Sochi had abnormal levels of salt and were tampered with in the laboratory. The IOC also sided with bobsled’s governing body, known as the IBSF, which is going to the Court of Arbitration for Sport to challenge its own doping tribunal over its view of Russian whistleblower Grigory Rodchenkov. It was Rodchenkov’s claims that triggered investigations into the Sochi doing program. The tribunal has refused to provisionally suspend two Sochi gold medalists — bobsled pilot Alexandr Zubkov and skeleton racer Aleksandr Tretiakov — despite their disqualifications and life bans by the IOC. The IOC said it “cannot understand nor accept the conclusions” of that ruling. The IOC said it is seeking to join the IBSF in its appeal.